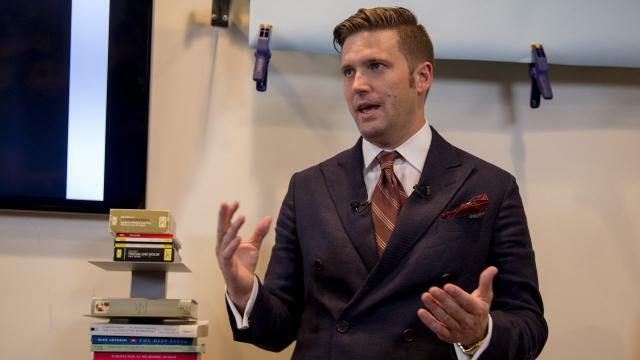 GAINESVILLE, Fla. — The president of the University of Florida said white supremacist Richard B. Spencer wants the speech he will deliver Thursday to spark violence that will gain sympathy for the alternative right movement he represents. Spencer and his supporters will thrive on any confrontation brought by anti-fascist protesters, warned university President Kent Fuchs. They hope to provoke the same violent clashes that broke out during an August rally in Charlottesville, Va., that left one woman dead. Alt-right refers to a loosely defined group whose far-right ideology includes racism, populism and white nationalism. Organizers for Spencer’s speech further complicated security arrangements by planning to wait until an hour and a half before the event to distribute tickets. Only people who look like alt-right supporters will be among the 700 people allowed inside the Phillips Center for the Performing Arts. Cameron Padgett, an organizer for Spencer’s National Policy Institute, said people who disagree with Spencer’s racist rhetoric planned to receive tickets from the university and then throw them away. At least one bar also offered to trade the tickets for booze. “There’s only so many tickets we’re allowed to have for the event, so it didn’t make sense to let that happen,” said Padgett. Regardless of when the tickets are distributed, Padgett said security isn’t his problem. That’s on law enforcement. The potential for violence at the event was enough for Alachua County Sheriff Sadie Darnell to ask Florida Gov. Rick Scott to declare a state of emergency. The order Scott issued Monday allows Darnell to call on specialized security teams from across the state. It also places the Florida National Guard on standby. Fuchs said his university is the first to host one of Spencer’s speeches after the deadly rally in Charlottesville. Along with the University of Florida, Padgett also applied for Spencer to speak at Ohio State University and the University of Cincinnati. U.S. Supreme Court case law upholds his right to speak, Fuchs said. Fuchs first rejected Spencer’s request to speak in September because of security concerns so soon after Charlottesville. But now all that remains is the potential for violence. “If they don’t have that or evidence that something terrible will occur, I don’t see how they’ll stand a chance in federal courts in banning him forever,” Fuchs said. One advantage University of Florida has is its massive campus. The Phillips Center sits on its western edge, away from most classrooms. And unlike Charlottesville, the university has had weeks to prepare. Protesters will be separated from alt-right supporters by bulky barriers, and law enforcement officers will be patrolling on foot, Fuchs said. 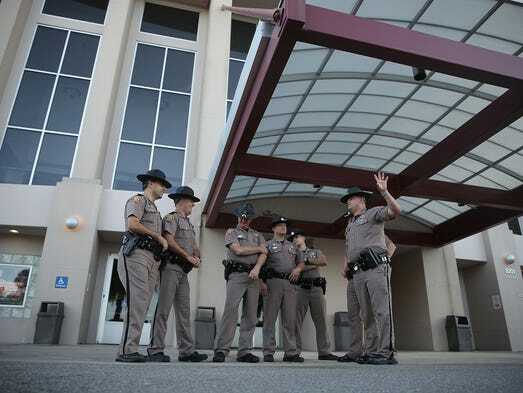 Troopers from the Florida Highway Patrol spent Wednesday patrolling the Phillips Center in military formation. University crews boarded up metal parking booths and placed barriers throughout the area. Fuchs hoped that most of the activity associated with Spencer’s visit will be kept away from students still attending class. He also hoped students would skip the event.